‘King of Property’ John McElwain was Kingsland’s first land developer. In 1882 he subdivided his farm ‘Willow Glen Estate’. 227 allotments were laid out in four avenues between Kingsland Avenue and Central Road. 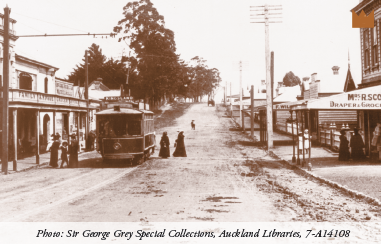 Known as McElwain’s Hill, the incline of the steep road between Kingsland and Morningside villages was reduced three feet by the Auckland Provincial Council in the late 1880’s.